The problem is determining whether theres really a problem or the reviewers just need to learn how to use the motherboard and BIOS options properly. Wes, Gary, and most of the rest of the AnandTech crew seem to know how to really get results out of motherboards. I saw an article a few days ago that was an absolute joke when it comes to OCing. They took a 4200+ and were crowing about a 240 MHz HTT bus overclock or something. I don't think they ever even tried the other memory ratios. Anyway, registry corruption? Yeah, I've lost the registry a few times on Intel and AMD systems when pushing the OC a bit too far in the wrong way. Bad memory timings for an OC can be just as harmful as a bad CPU or chipset OC - probably even worse. OC'ing is not really that easy if you don't know what you're doing. Too many people want to just increase everything 25% and then tehy wonder why the system won't POST. Someone on AT did some OCing articles last year about the topic that really provided some good details, showing 2.6 GHz or so with an X2 3800+ using everything from POS value RAM up through top quality TCCD and CH5 modules. Probably took a hell of a long time to complete all the testing as well! If you want to do a motherboard review right and you want to look at overclocking, you simply can't do that without spending a good month or more with the board. Sometimes a seemingly small change will stabilize what appeared to be a hopeless OC. The problem is determining whether theres really a problem or the reviewers just need to learn how to use the motherboard and BIOS options properly. Wes, Gary, and most of the rest of the AnandTech crew seem to know how to really get results out of motherboards. I saw a HardOCP article a few days ago that was an absolute joke when it comes to OCing. They took a 4200+ and were crowing about a 240 MHz HTT bus overclock or something. I don't think they ever even tried the other memory ratios. You certainly make good points. However one review of "good" and many, many of "bad" doesn't lead me to think the "good" just knew what they were doing. In fact it's quite the opposite. It leads me to think they didn't dig deep enough. I will take a different path on this one. We were allowed a first look at the board with Conroe back in early May, in fact if we could have stayed an extra day we would have had significant hands-on time with the setup. 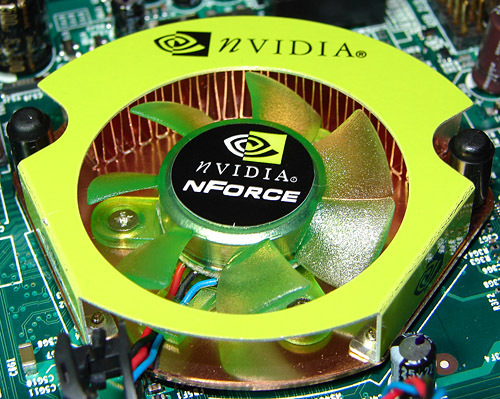 We were also one of the first sites to receive a board from NVIDIA for the specific purpose of testing the board to provide specific feedback regarding Conroe compatibility and performance. I easily have over 200 hours of test time on this board along with a couple of pages of issues/improvements/suggestions we would like to see before the design goes into production. As far as not digging deep enough, I doubt we would have had this early of an opportunity if it were not for our work (and that of several AT readers) with NVIDIA over the past several months in assisting them and the board suppliers to get their Intel performance up to speed. We are still very disappointed with the FSB overclocking results with the NVIDIA Intel designs but our initial board had no issue running up to 304FSB with an early Conroe sample. I am personally disappointed with the entire FSB issue since last fall as I had a couple of boards that easily did over 320FSB only to see this capability whacked when the product was released. Yes, the board will use the nF4 SLI SPP for the "Northbridge" but it is now at a C1 stepping after several months of tuning due to the issues found last fall in the first release. Are we disappointed that we will not get the newer C51XE SPP, yes, but the time to develop it along with the switch to a single dual x16 chipset this winter made it impractical for NVIDIA at this time. The good news is the NV590SLI boards should cost around $150 at launch with a feature set that will not be matched by Intel or ATI along with using the new MCP55PXE so drive and network performance is greatly improved from a stability viewpoint. We did not post the actual memory scores as we are waiting on a new board revision and production level bios before making any final statements on this subject and FSB overclocking. However, even with the 805D the base unbuffered Sandra scores were about 2% better than the i975x. When overclocked, this margin flipped in favor of the Intel board. The margin was even greater during our Conroe testing. I am still concerned with the FSB overclocking capability. I stated this at the end of the article, it is a concern and will remain a concern until we see production level boards. I think it will improve compared to today's products but I doubt we will see anything near what the i975x and now P965 chipsets will be capable of in the high end boards from Asus, DFI, Abit, MSI, and Gigabyte. However, getting over 300FSB is a requirement we have placed on NVIDIA at this time. It will be interesting to see if they can get there now. Almost every p$ chipset capable of 10066 FSB since i865 tiems DOES support Conroes. Just crippled Intel 915/925 series do NOT bute even this is caused by intel marketing decision not the capability of chipset design on itself.